& The People Who Create Them. ​Your Home or Your Business. ​For the Love of Art Month. ​2019 Santa Fe Studio Tour Schedule! ​10:00 a.m. – 5:00 p.m., each day. show and sale their artwork! Come view the working studios of Taos area artists. Meet the artists and see the vast array of art. from pottery to paintings, jewelry to glass, photography, digital art, to stain glass, fabric art, sculpture to woodworking. ​Drive your car or make it a bike tour! Tour guides are available a few months prior to the event. Maps are available at the Taos Visitors Center and at the individual studios. Go to www.taostudiotour.org to see the list of participating artists and for more information. ​Gifts at Low Prices ! The Chama Valley Studio Tour is a free event open to the public. Children and pets are welcome at most stops. Find the Artist with our map. Each stop has a number in front. The Artists open their studios and display their work each year at the Chama Valley Studio Tour. The Artists are from the Village of Chama on the north, Chama West, Brazos Canyon, Los Ojos and Tierra Amarilla on the south. by artists in Costilla and Amalia, New Mexico as well as in Jaroso, Colorado. and the Southern most part of the beautiful San Luis Valley. Plan to spend the night in one of the local B&Bs. ​Head down that dirt road that you’ve always wanted to explore. the artist studio at the end will blow your mind." Twenty-four artists will be displaying their work at ten locations in Sandia Heights. To preview artists, download map/ brochure click on button below. Our Silent Auction begins Saturday morning at 10:00 am and runs through the close of the tour on Sunday, at 5:00. Items can be found on display at Stop 1 - Tower Gallery, 78 Cities of Gold Road, Pojoaque, NM 87506. All proceeds will help to fund our advertising for next year. ﻿PLAN AN ART GET-AWAY FOR YOURSELF on Sept. 15th or 16th! Diverse work representing three cultures distinguishes the outstanding art of the 25th Annual POJOAQUE RIVER ART TOUR. Bike or GPS your way in a day, from Pojoaque Pueblo, through Nambe and Pojoaque, to San Ildefonso Pueblo, starting just 15 minutes north of Santa Fe. On Friday, September 15, 5-7pm, the Artists' Reception, hosted by Than Povi Fine Art Gallery (Exit 176 in Cuyamungue), features food and refreshment, Native Dances, a Silent Auction, and the artists themselves! Always the last two weekends of September. Artists and artisans from El Rito and surrounding areas showing a variety of artwork. For 30 years, Galisteo has offered a unique New Mexico Studio Tour Experience. When you drive from Santa Fe to our historical village, nestled in the magnificent Galisteo Basin, you can leave time behind. A diverse population of artists, drawn here by the natural beauty of a high desert landscape, breathtaking sunsets and enchanted light, open their studios to you. We invite you to experience photography, paintings, pottery, ceramic art, jewelry, bronze sculpture, custom knives and hand crafted traditional arts. When you are hungry, our special food stops serve traditional New Mexican fare as well as contemporary fusion dishes. In our village, enjoy walking from studio to studio and experience our beautiful Fall colored cottonwood trees in the bosque. A short drive up the hill, visit studios in Rachitos and delight in panoramic views of the Galisteo Basin. Leave Galisteo relaxed and inspired, with art to remind you of your special visit. ​The Los Alamos Artists Studio Tour (LAAST) is pleased to present our fourth annual Studio Tour! This free, self-guided tour will take you into the studios of many of Los Alamos's artists to see how they work. The Tour will be from 10am to 5pm on Saturday, October 14th, and from noon to 5pm on Sunday the 15th. Our artists represent ceramics, fiber art, photography, painting, scrap metal sculpture, scratchboard, jewelry, woodworking and more. General inquiries about the Dixon Studio Tour, Click Here. The Dixon Studio Tour is one of the oldest continuously run studio tours in the state. 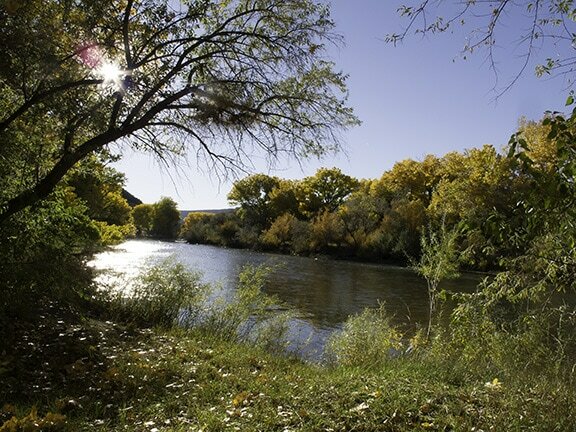 Dixon, nestled in the Embudo Valley in Northern New Mexico where the Rio Embudo flows into the Rio Grande, has been long known for its rich Native American and Hispanic heritage, productive farm lands and pastoral beauty. During the last 37 years many artists moved to the valley to pursue their artistic talent and a simpler way of life.